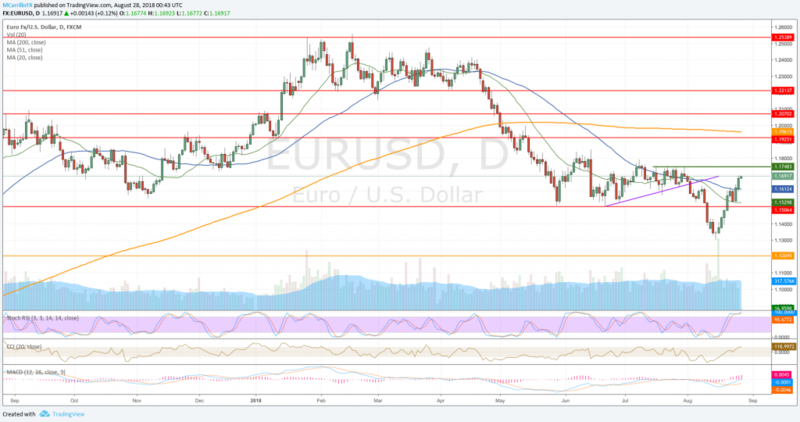 The Euro is now testing the 1.1700 area against the US Dollar as the pair has traded positive in eight out of the last nine days. Investors’ confidence remains high as risk appetite is back on the table and NAFTA deal lifted sentiment. Since August 15 low at 1.1300, the EUR/USD recovered almost 400 hundred pips to trade as high as 1.1695 on Monday and to stay around 1.1685 on Tuesday. On Monday, news of an imminent NAFTA del between Mexico and the United States took the wires and lifted market sentiment. US stocks rallied on the news and risk appetite fueled us dollar major rivals. Back to the EUR/USD, the pair is trading positive on Tuesday as it is approaching the 1.1700. If the pair consolidates gains above that level, the real test will come at the 1.1750, a level that has been containing the pair’s upside potential since the second half of July. “Daily RSI still has room to go until overbought territory. 1.1780 is objective in clearing the cloud as being the 8th July highs, slightly above the 100-D SMA located at 1.1770,” concluded Burland.